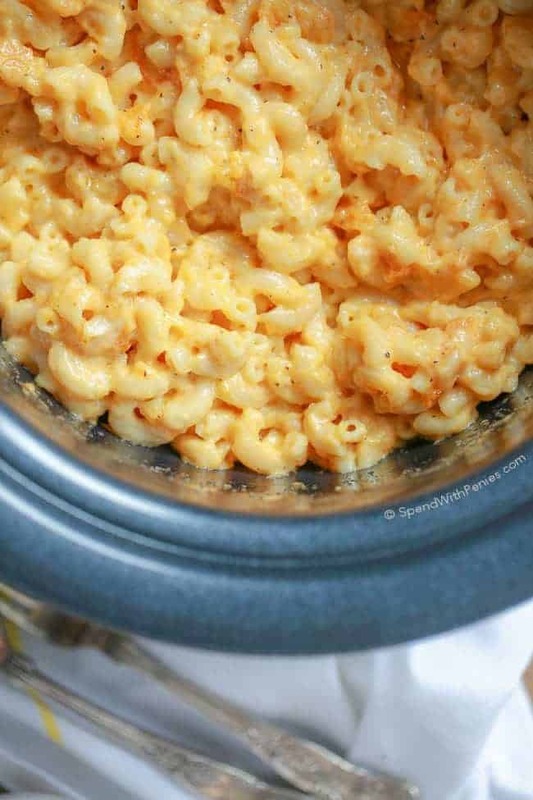 Crock Pot Mac and Cheese is a family favorite recipe! Tender macaroni noodles smothered in cheese is one of our favorite comfort food dishes. This easy mac and cheese recipe requires just minutes of prep and comes out of the slow cooker perfect every time! Macaroni and cheese is my personal favorite comfort food recipe (although, what do you expect from a girl who served mac ‘n cheese at her wedding and totally skipped the prime rib!). It’s not completely from scratch, but it is completely delicious! To make it even easier, this extra cheesy mac and cheese is cooked in the slow cooker! Some people wonder why you would cook mac & cheese in the slow cooker… there are lots of good reasons! 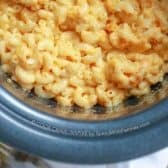 Crock Pot Mac and Cheese is perfect for camping or potlucks, basically anywhere you don’t have an oven to bake macaroni. No need to heat up the oven on a hot day. Can fill your oven with things like a 15lb turkey and stuffing and cook this on the side. Ummm, it’s freaking delicious (just scroll down and read the comments, you’ll see what I mean)!! This slow cooker macaroni and cheese takes less than 10 minutes to get into the Crock Pot and then it’s ready to go! Fast, easy and beyond amazing! While I’ve tried several times to make a no boil mac and cheese (using uncooked pasta), I find that they never turn out quite as good as this recipe! Boiling the macaroni about 2 minutes less than indicated on your package (so it’s quite al dente) keeps it from getting mushy. I prefer macaroni without evaporated milk or velveeta. While some of the ingredients in this recipe may seem odd, they really make an amazing dish! Here’s the thing about cooking dairy in a slow cooker. A traditional cream sauce or cheese sauce doesn’t hold up well in the slow cooker, they tend to curdle and/or separate. Please don’t don’t let the addition of mayo freak you out. It’s good, I promise (read the reviews on this recipe below) … it just subs out some of the dairy. I usually use a light mayo type dressing. I don’t make it very often because when I do, I can’t stop eating it. In fact, I wake up and eat it for breakfast too if I’m lucky enough to have any left! If you’d like to make it into an entree, feel free to add in some ham and broccoli or cooked chicken and leftover veggies! I have successfully doubled this recipe in a 6QT slow cooker. Cook on high for 2 1/2 hours, stirring after 1 hour and 2 hours. (When stirring, try to do it as quickly as possible to keep the heat inside). Note: Slow cookers can vary in temperature greatly! You may have to slightly adjust the time for your slow cooker. If your Crock Pot Mac and Cheese is done early, you can turn your slow cooker onto warm. Homemade Mac and Cheese Casserole – The best ever! 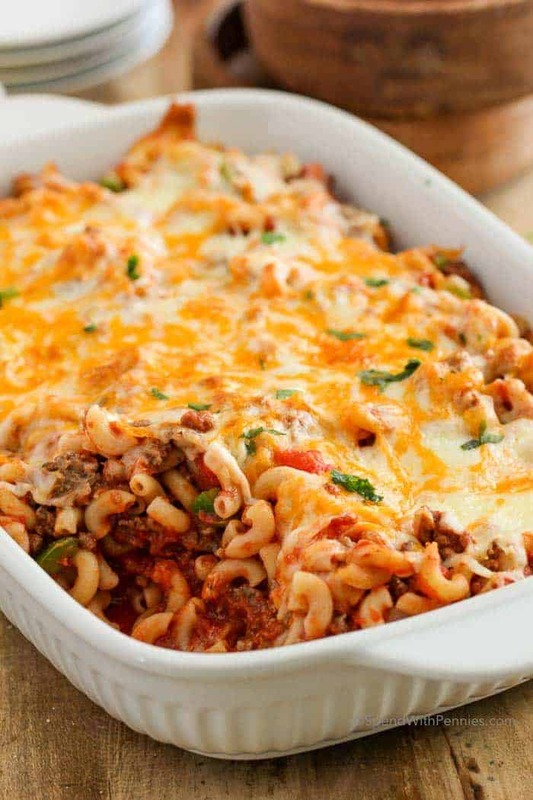 Cheesy Beef & Macaroni Casserole – Hearty and comforting, a perfect family meal! Stove Top Macaroni & Cheese! (Ready in about 10 minutes) – Quick! Instant Pot Mac and Cheese – Perfection in minutes! 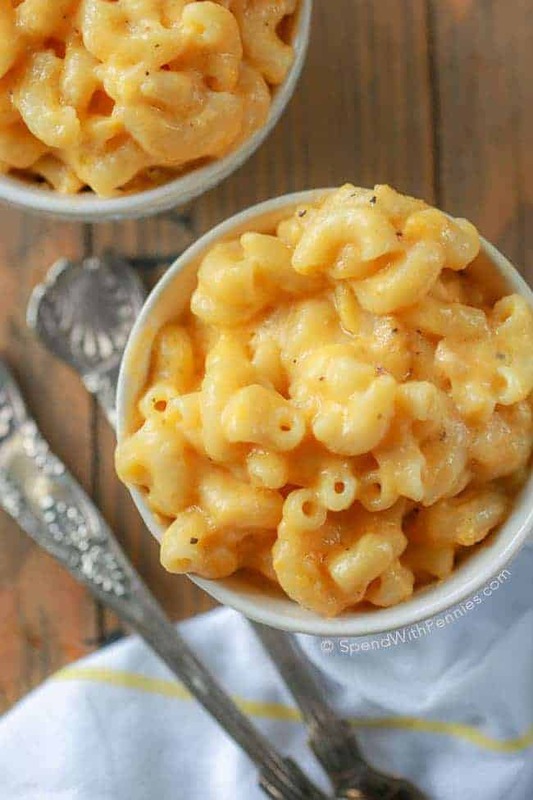 Extra Creamy Crock Pot Mac and Cheese. Macaroni and cheese is one of our favorite comfort food dishes, a smoothy cheesy sauce with perfectly tender pasta. This easy recipe required just minutes of prep and comes out of the slow cooker perfect every time! Boil macaroni noodles according to directions to make them very al dente. (I cook them for at least 1 minute less than directed on the bag. Mine boiled for 5 minutes). Drain and rinse under cold water. Combine all ingredients in the slow cooker and cook on high for 2 hours or low for 3 hours, stirring once or twice. Be sure that your macaroni is cooked al dente before you put it in the slow cooker so it doesn’t become mushy. If you prefer or if you are short on time, you can bake this in the oven (and I have many many times!) Preheat the oven to 350 degrees F. Bake 30 minutes covered and 30 minutes uncovered. If you do not have gruyere cheese, you can use 4 cups cheddar instead. This is the BEST Mac and cheese I’ve ever had. I had my doubts about the mayonnaise but I’m glad I tried it. THANKS, HOLLY!!! Yay Barbara!! So glad you love it as much as I do! Question. If I double the recipe and bake it in the oven, do I use a 9 x 13 pan? Do I grease the pan? As long as the recipe fits in your casserole dish, it will be fine to bake. You’ll just want to ensure it is hot in the middle. Enjoy Kathy! I want to try this recipe to bring to work. Can I make it in the evening and turn the crock pot to warm the next day to eat? Yes it can. It can also be prepared the night before and cooked while you’re at work the next morning if that works better for you. Enjoy Meghan! I’ve made this recipe several times over the last month for my kids’ ski races. I always double it. I have modified it a little. I use 1/2 of the onion powder. I found it to be too strong and it was all I tasted. I was more generous with the cheese – I really squished it down into the cup to measure it. I also added some Fontina cheese to make it a little creamier. About 4 oz. for a double batch was perfect. It came out a little bit more cheesy and everyone liked it better. The real key is to undercook the pasta. I ended up with it in the pot for no longer than 3 minutes. 2:30 is best. If my daughter knew it had mayo in it, she would never eat it, but she totally LOVES it, so all is well. Shhhh…. Your version sounds delicious too, thank you for sharing Amy! This recipe is very delicious. I follow the recipe to the T. Although it turned out too greasy. Both in the crock pot, and the oven. Is there any way to stop this from happening? The taste is definitely five stars, it’s just too greasy. I would suggest reducing the cook time. If cheese overcooks (or perhaps your slow cooker runs a bit hotter than mine) it can separate creating an oily layer. Hope that helps! I made this for a New Year’s party and it was GONE! Also, my picky mac and cheese eating kids devoured this. I really love that in general I already have these ingredients on hand. Anxious to try this recipe for a bunch of hungry teenagers after long day of skiing. I would like to add ground beef to add protein, have you ever tried that before? I haven’t but I think it sounds absolutely delish!! Let us know how it goes if you try it! For the Cheddar cheese, is it the block cheese or I can use Shredded? Block cheddar shredded yourself will melt better. The pre-shredded cheeses often have additives that can interfere with how they melt. You’re welcome! So glad it was raved about! This is my go-to Mac and Cheese for dinners, parties, and potlucks! I’ve been asked by my co-workers to QUADRUPLE the recipe for next year’s holiday party! So glad everyone loves it Dan! How many servings does it make without doubling it? As written, this will serve 6 as a side dish. I made this a few years ago for my child’s class when the had a Thanks giving feast. The teachers asked me to bring it for the 3rd year now! I was wondering if you have tried it in the instant pot? So glad it’s been a hit (I personally love this mac & cheese so much too)! I haven’t tried this exact recipe in the IP although I do have an Instant Pot Mac and Cheese here. How long can it sit in the crock pot and still be good? Can I make it in the morning at home and take it to work for a noon lunch at work? I would suggest making it in the morning but not turning the slow cooker on until 2 hrs before eating (on high) or 3 hrs on low. Looks delicious! I plan on making this for our work Xmas potluck lunch this week. I’ll be at work for 5 hours before this is served.. will it work if I cook the noodles at home in the morning and then just add everything together and turn it on low 3 hours before lunch? Absolutely! I keep the macaroni and sauce separate and then combine just before cooking. Enjoy! I tried this for the first time at a work pot luck lunch. I was skeptical about the cream of chIcken soup but went with it anyway. Everyone enjoyed it. I was not disappointed. Thanks for sharing. So glad everyone enjoyed it Sandra! What size of cream of chicken soup? Did you add a can of water or just use the condensed soup? The soup is intended to be added condensed (no water). and I considerd combining your baked mac-n-cheese recipe with this one and adding a pinch of cayenne and a small amount of goat cheese for a creamy tang, smoked gouda and of course cheddar and gruyere. I really don’t want to use the cream of chicken soup because of the MSG… so I thought about just the cheddar cheese soup because I don’t think it has it… thoughts? Any cream soup will work for this recipe Joshua! I’ve been noticing many more options without MSG. Joshua, I’m just the opposite about MSG. We use it instead of salt for everything. It has such lower sodium content than salt and it really makes the food come alive better than salt and is healthier for you. I know the old tale about giving folks head aches but I have never met one! This recipe was great and we will be making it again and again. We baked ours also. Thank you for sharing your experience. Happy to hear that you love the Mac and cheese! You could try yogurt or greek yogurt in place of the sour cream. I doubled the recipe, substituted smoked Gouda for the Gruyère, added 1 tsp Worcestershire sauce, substituted 1 tsp chipotle pepper sauce for the black pepper and added 1 cup of milk. I would have preferred it without the milk, but there were a lot of kids at Thanksgiving and they seem to prefer a soupier Mac & cheese. This is now my go to Mac and cheese recipe. Love your additions Dan, thanks for sharing! Made this for a Family Christmas Gathering and it was a HIT!!! Will Def make this again! I’m so glad you loved it! Happy thanksgiving! I looked at several recipes and decided to go with this one because i don’t like Velveeta and the ingredients intrigued me. Also the reviews from others convinced me too! So my daughter 15 yrs old, made double recipe using all mild cheddar. We bought the blocks and shredded them. Don’t use pre-shredded cheese. At lunch, she got so many compliments and requests for the recipe! It was a hit! They were saying now this is the thing she needs to bring every Thanksgiving! Thank u very much! I’m making this for an office pot luck on Wednesday and sorry if this is a stupid question but what do you mean by 2 cups of macaroni? Is that equal to a whole box ? Or should I scoop out two cups of dry macaroni from the box? It depends on the size of the box. You should scoop out 2 cups of dry macaroni from the box. I tried this recipe last night but I decided to try a mix of cheeses: 2 cups sharp cheddar, 1 cup white cheddar, 1/2 cup mozzarella and 1/2 cup Parmesan. The flavor was awesome but it wasn’t as creamy as I was hoping. Any tips on how to make it creamier without losing flavor? That sounds like a great addition Morgan! I have only ever made this recipe as is, but you could try adding a little extra sour cream or milk to the slow cooker. We love mac and cheese but are really fussy about it. 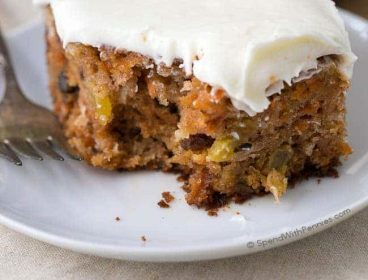 This recipe looks like one that would pass our taste test~ Yum! What would you suggest using instead of the cream of chicken soup to make it vegetarian? Could just milk or heavy cream be used maybe? I’m looking forward to making this for Thanksgiving! You can use cream of celery or cream of mushroom. Made this today and it turned out super yum. Macaroni didn’t turn out overcooked/mushy! Yay!! It is super yum, I agree Becky! Can not wait to try this. How many does this serve? This recipe makes 6 good sized servings. You’ll be so glad you made it Debby! Has anyone tried to use whole whet pasta? If so, how long did you boil beforehand, I know it usually take a little longer than regular pasta. Making this today and I can’t wait to try it! I’m sure it will taste just a yummy with whole wheat Jenny! I just made this. Its only been in the crockpot for an hour so far and it is delicious! So glad you loved it Angie! Is the cheese a block that we cut up or is it shredded??? I use shredded cheese Karen. Do I have to cook the macaroni first? I’d like to put all the ingredients in the crockpot and add milk. This recipe starts with the macaroni pre-cooked. 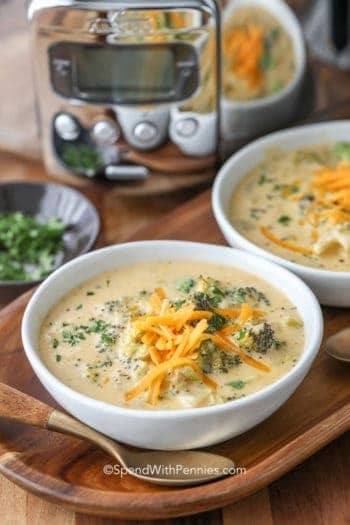 I’m looking for a creamy cheesy sauce to add to potatoes in a crockpot. I know if I add cubed potatoes raw they will take longer to cook. Do you think this sauce would do okay if it’s left in the crockpot for a longer time? Hi Heather, I do think the sauce would hold up fine if the potatoes cook through (but I haven’t tried it). Depending on your timeline, you could also parboil the potatoes up to 24 hours in advance so they’re slightly softened before you start! Let me know how it goes! I used about 6 small russet potatoes, peeled and cubed. While I parboiled those, I threw the rest of the ingredients into the crockpot. Small changes: For cheese, I used about 1-1/2 cups medium cheddar, 2 cups colby jack, and 1/2 cup mozzarella. It’s what I had on hand! I added about 1-1/2 cups of milk, since I wanted more of a soupy consistency instead of just a sauce to coat. I also threw in 1 teaspoon minced garlic. It was delicious! I actually got my husband to eat soup! You could definitely taste the tang of the mayo and sour cream though, so maybe next time I’ll just use one or the other, not both. Thank you for the recipe! Thank you for sharing Heather!! I’ll have to try that, it sounds delicious! This recipe was a hit at my son’s birthday party! Not only was it so easy to make but the adults and the kids really enjoyed eating it! So glad to hear that it was such a hit Tiffany! Fabulous recipe! A friend made it for a potluck and I asked her for the recipe on the spot. 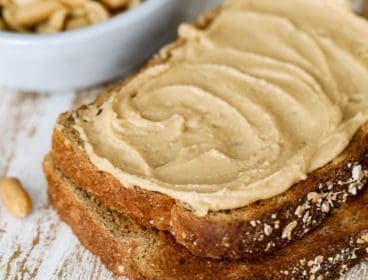 Have you heard any tips from someone who has made this recipe in an Instant Pot (using the slow cooker setting, of course)? You may want to try my Instant Pot Mac and Cheese. Enjoy! Very delicious, restaurant quality Mac n cheese. Very easy to make to. Question. I need to have this tomorrow for a lunch. I’ve used this recipe before and I love it. But I don’t have time to cook tomorrow. What should I do? Bake it in the oven or crockpot and just heat up on low for how long if I do it in the crock pot? I don’t want it to be over cooked. I would suggest mixing everything together and then cooking as recommended just before serving. I plan on making this recipe this weekend, but one of my guests is a vegetarian so I was pondering different alternatives to the cream of chicken soup. Has anyone tried this with Campbell’s condensed cheddar cheese soup? If you have, let me know how it turned out! Cheddar cheese soup would also be a great option. Some readers said it worked well for their vegetarian friends! Made today for a side for Easter Dinner,Oh man !!!!!! It’s the Bomb.. I am so glad you enjoyed it Catherine! This was amazing, followed exact recipe, came out perfect. Have been looking for the ultimate creamy mac and cheese recipe and finally found it, thanks! So glad you loved it Nancy! When you say “2 cups” of macaroni and cheese, is that 1 lb, or are you scooping out a 1 cup measuring cup? 2 cups =16 oz = 1 lb of macaroni. Just trying to figure out the ratios before I head to the store. This is not 1 lb as a dry measure is not the same as an 8oz fluid ounce measure. This is two measuring cups scooped out which is about 4oz per cup (so 1/2 lb for the whole recipe). Hope that helps. Does it matter if you use sharp or mild cheddar cheese? You can use either but sharp will have a stronger flavor. Can I use miracle whip in place of the mayonnaise? Miracle Whip can be used in place of mayonnaise, but keep in mind that it has a tangier flavor. Let me know if you try it! Hi! I’m excited to try this recipe and adding broccoli to it. My question is if I am using fresh broccoli should I steam it first before adding it or put it in raw? I suggest that you add cooked broccoli rather than raw. If you double the recipe, you’ll want to double the cheese. Quick question….I’m excited to try this out for my son’s Blue and Gold ceremony with scouts tonight. Some other recipes I’ve read have warned against letting it heat too long because of gumminess of noodles. If the ceremony starts at 5:30 and I think we will eat at 6, should I start this at 3:30, or have you had issues with extra heating time as people eat? If you’re sure to undercook your noodles as directed, it should be fine. This is the best recipe ever. SO YUMMY!!!! And if you leave it on all day, the edges get crispy. So good. I always have to double the recipe because it’s such a hit. Haven’t made this in a while but the when I did make it I noticed that when it’s reheated, the oil likes to separate from the rest of it and makes a greasy mess. The oil from the mayo and the fat from the cheese really makes it too greasy. Next time I make it, I think I’m going to try sour cream and maybe an egg or two in place of the mayo. This is seriously the best Mac n cheese I have ever made and eaten. Thanks so much for sharing. Anyone can be a great cook with this recipe. Yay, so glad you loved it Gina! It really was as good as it claims to be. The only thing is I cooked it on high and some of the edge was a little burnt. I suggest using the low setting if you have the time. My son made this to go with barbecued ribs. He substituted nonfat plain greek yogurt for the sour cream and four cups of cheddar cheese. It was awesome! This is now one of my favorite recipes. This was a huge hit at our holiday party! I didn’t have cream of chicken, but did have roasted garlic cream of mushroom & it was a great substitute. I am so glad this was a hit at your party! Made it the first time for work Xmas party. Today I’m making it for a 4th time since as my dish to pass!! I have doubled it each time as written except only used cheddar cheese and six cups total, as my arm was too tired to shred more. I would give it a five star rating!! I LOVE macaroni and cheese and I’m always trying new recipes to find the perfect one, I’ve tried ones that are so complicated, and at best ,they have turned out OK…I was a bit leary to try this – thinking mayo and cream of chicken soup in mac and cheese? But seeing I had everything on hand (except for the gruyere cheese), so i went and got that and made it…..My husband and I LOVED it…the best thing is, it doesnt dry out as badly as most recipes do–the next day it was equally as creamy and delicious…..this will be my go to recipe from now on for easy and delicious mac and cheese–the only thing i will do differently next time, is Double the recipe!!!!!!!!!! Try this, you wont be disappointed!!!! I am so glad you enjoyed this recipe! I always double it too because my family can’t get enough of this mac n cheese! I made this recipe exactly as printed and it was absolutely fabulous! I doubled it because it was for a pot luck at work. Picky Mac n cheese eaters really liked it. I will definitely be making this again!! Thanks for sharing. I am so glad this recipe was a success even with your picky eaters! What is the serving size? I’m making this as a side dish for 15 people and want to know if doubling the recipe is enough. Approximately 1/2 cup per serving. The best everyone loved it! Make a double batch it goes fast! I am so glad that this was a hit with your family! Followed this recipe pretty close even though I was skeptical of the cream of chicken soup and onion powder. Used both block cheddar and gruyere grated fresh with rough measurements (probably a little more than required) and used the whole bag of macaroni noodles. (16oz) See a pattern here…more is better! Turned out amazing. The real test is the grandkids tonight. But I’m secretly hoping they don’t like it so I can hoard the leftovers. However, do not make this ahead of time. There is a true risk of eating it all before anyone else gets a chance. DELICIOUS! I will make again and again. I’m so glad you loved it Donna!! 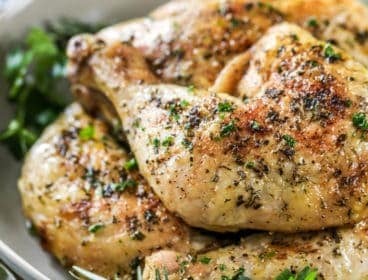 Once cooking in the crock pot, is it ok to transfer to a baking pan and adding bread crumbs on top to broil for a few minutes? Or will this dry it out? As long as it doesn’t cook to long it should be ok.
Made this tonight and my family loved it. I used cream of celery soup, earth balance mindful mayo, 3 cups of sharp cheddar, 1 cup of Colby jack, and light sour cream because these are the things I already had in my fridge. It was wonderful. Thank you for th recipe. My husband asked me to make it again. I’ve been working years to nail what I think is my favorite mac & cheese recipe, that I can do consistently… I think I’ve found it with this recipe and the family loved it for Thanksgiving! I didn’t adjust a thing! Thank you. I have a degree in Culinary Arts and this is THE BEST mac and cheese I have ever had! I did give it a bit of a twist…I used both cream of chicken and cr.of chick. with herbs, since I doubled the recipe. I used the Gruyere, sharp cheddar, mozzarella, a Mexican blend, and an Italian blend, a little cottage cheese (and not as much sour cream) and a few shakes from the granulated garlic. I am so glad you liked this recipe Carol! Hello. Can I just use 16oz of the block cheese and just shred it myself or does it have to be the bagged shredded cheese? You can definitely shred it yourself. Shredding it yourself makes the best sauces as the bagged shredded cheeses often have additives so they don’t stick which can affect the way they melt. Can you used smoked gruyere that’s all I could find in my grocery store? I haven’t tried it. It would change the taste slightly, but I think it would be delicious! I’ve been making this recipe for atleast 3 years. Fell in love with it since day one!!! Has always been my go to and it’s devoured everytime I bring it to parties but lately we’ve been getting a bit more health conscious and i hate how much oil comes out and settles on top. Any suggestions? So easy and delicious. I’ll be making this as a holiday side dish! This was fantastic. I made it for the office potluck and was worried about how it would turn out having never made it for just home. Everyone complimented on how tasty it was. I used cream of mushroom soup to make it vegetarian. You’re welcome! Glad to hear it turned out so well! Not a huge fan of Mac & Cheese, but this dish was super delish! I meant to condensed soup… auto word prediction. Is the soup in the recipe concerned soup? If so, do you dilute it?? Yes it is concentrated and you do not have to dilute it. Just add it right from the can. LOL I agree Sam, I can’t stop eating this when I make it!! So glad you loved it Marc, it’s definitely my favorite! Most amazing thing I’ve ever eaten. I started it in the morning and it was ready the minute people started arriving. It was to die for. It was literally gone in less than 10 minutes. Guest were trying to scrap off the burnt bits off the side. It tasted like real homemade Mac & Cheese. Even the texture was the same. I doubled the recipe and used only cheddar and it was amazing! This recipe is definitely going to be on my regular rotation. You won’t be disappointed. It’s the best! I’m so glad you loved it Natalie… definitely one of my favorites too!! I tried this for the 1st time and it smelled awesome. Taste was top notch! My only complaint is with shredded chedder cheese, the texture when it hits your mouth is not good at all. I will make this again but maybe with a different kind of cheese. Thanks! Made this last night and we did not care for this at all. Did not taste like Mac n cheese. No offense but do not waste your time. It looks really good but I prefer to eat my pasta al dente…I always find the other way just doesn’t quite taste right to me. Wonder if I could cook the pasta for maybe just 2 – 3 minutes and have it al dente when done?? Has anyone tried that? Don’t be afraid to add the mayo. You will not taste it and no one will ever know it is there, but you do need it for the extra creaminess. I have made this dozens of times. We absolutely love it and I get raves when I take it to potlucks. You can’t beat it. I use 2 cups of cheddar, 1 cup of mozzarella and 1 cup of gruyere when I make it. Everything else I leave the same. Sometimes I’ll stir in a handful of crisp crumbled bacon before serving. It will be 8 cups of cheese for 6qt. Slowcooker? My family loves cheese (especially my sons) and we make this recipe for crock pot mac & cheese often, it’s even requested by our extended family for just about every get together. It’s so easy to make and deliciously rich & creamy! 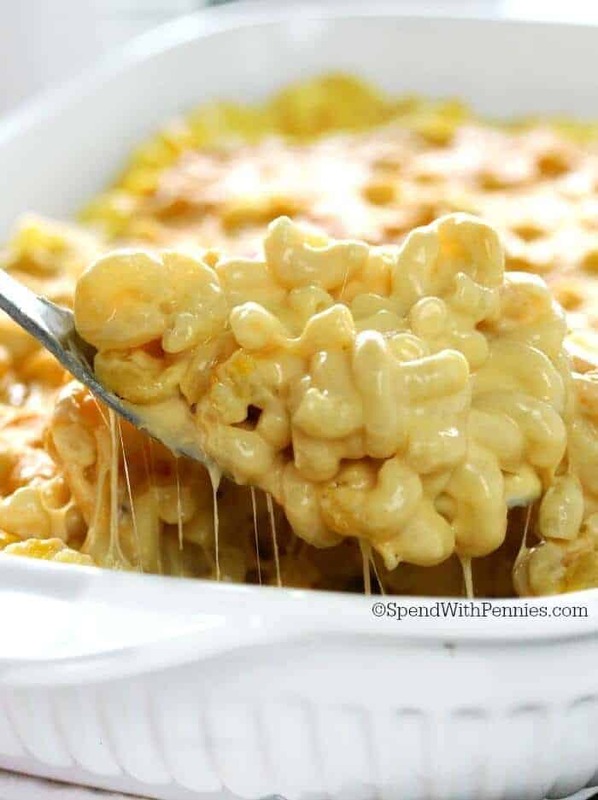 It took me a long time to find a mac & cheese recipe that we all really enjoy and after I found this 1 I was able to stop looking. Thank you! I am so glad to hear that Jesseca!! Thanks for dropping by! I’ve made this twice now, and it’s delicious. One time I made it for my son who’s a mac and cheese snob. He loved it and asked when am I going to make it again. This is now my go to mac and cheese recipe. Just set it and forget it. Then you have a great dish without heating up the house with the oven. I am so glad your family has enjoyed this recipe! I made this last night. Holy doodle! It was a side to my meatloaf, and I had to force myself to stop eating it, so I wouldn’t make myself sick! SOOO GOOD! It is now in my go-to section of my recipe binder. Yum! I’m looking for crock pot recipes I can make and leave the house. I’m bummed this has to be stirred. What if I make this in the morning and heat it later. Has anyone tired making ahead and heating? How does it taste? I think it tastes even better on the second day Tiffany. I hope that when you make it, you LOVE it! Just wondering…can this recipe be doubled? It looks delicious! Hi Jane, if your crock pot is big enough to hold it, it can absolutely be doubled! I saved the Spaghetti Casserole Recipe and the Slow Cooker Creamy Mac and Cheese. Thanks for sharing. Awesome! Let us know when you try them! Thank you. I’m assuming that the recipe here is NOT the doubled version? The recipe here is a single version. I made this tonight with a few changes….. I thought I had cream of chicken and I didn’t, so I used cream of mushroom instead. I also added shrimp. And I used a bunch of different cheeses, a little bit of everything I had in my fridge…… mozzarella, cheddar, pepper jack, monser, and Monterey Jack. It was AMAZING!!!! Like I’ve seen many comment, I was skeptical of the mayo…. but it was amazing! Cant wait to try it again!! I’m so glad you loved it Sonya! 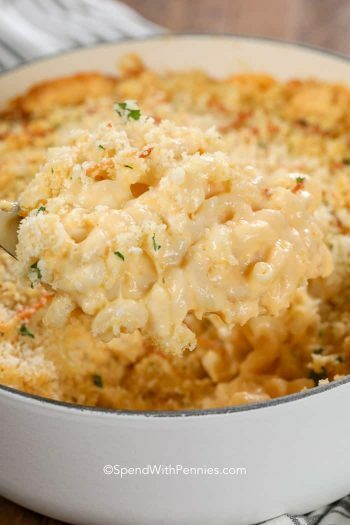 I would like to try this recipe tonight ad my family loves homemade mac n cheese. I have a slow cooed amd a crock pot. Which one do I use as I see both words use throughourt the recipe area and in comments swctions. Crock Pot is a brand of slow cooker. You can use either, I use a 4qt slow cooker for this recipe. Kids love Mac & cheese. This is a keeper. I haven’t had great success with freezing cooked pasta. is there a substitution for the condensed chicken soup ? Don’t care for the little bits of chicken that get mixed in . Cheddar cheese soup would also be a great option. This was the best mac & cheese I’ve ever made and I brought it to work and it was a HIT. I only changed a few things up.. I used Pepper Jack cheese because its my favorite and queso cheese. added bacon and fresh chopped jalapenos (added when half way done cooking then topped with a bit of Mexican bleed cheese. Thank you for the recipe! Can any cheese be subbed? I love this uses gruyere, but want to use something other than cheddar. Colby is good in mac and cheese! Sometimes I also like to use pepper jack to add a little spice to the mix! When you say or 4 cups of cheddar cheese instead of the gruyere cheese, does that mean 7 in total? Going to make this as a side for a family get together, six adults and two young children. Do you think I could get away with not doubling it if it is a side not an entrée, or would you recommend I go ahead and double it? It makes about the equivalent of a 9×13 pan. You could probably get away with 1 batch but there wouldn’t be much extra. This receipe looks good and im going to cook it tonight. When doubling, do you mean double all the ingredient amounts? Yes, this could be doubled by doubling all of the ingredients. I’ve made this many times now and it’s great, love it. My only issue is with re-heating. It seems to form into a clump in the fridge, and then gets really oily when it’s re-heated, either in a pan or in the microwave. Maybe it’s because I used shredded cheese? I’ll have to try block cheese instead next time and see if that helps. I made this yesterday for dinner, and I will say, as written this is the best Mac & Cheese I have ever had, I did not change anything. I’m so glad you loved it Lee! For vegetarians what other kind of soup would work instead of cream of chicken? You could try cream of celery or cream of cheddar. Can you make without the chicken soup. I have only tried this as written. Another type of soup can be substituted if you’d like. The soup is a sub for dairy since dairy doesn’t hold up well in the slow cooker. Loved this mac and cheese. I have made it several times I nice I tried cream of celery soup didn’t care for the taste, felt cream of chicken was much better. SO glad you love this Debby! I just made this for my family tonight! My kids are super picky when it comes to Mac and Cheese and they LOVED it! Mine turned out a bit more hearty- as opposed to creamy. Any suggestions? I was thinking of adding milk after it was done (as I’m told milk doesn’t do well in the crock pot). I’m so glad they loved it!! If you’d like it more creamy you can reduce the cooking time slightly or add a little bit of milk or cream before serving. (And you’re right about dairy in the slow cooker, it tends to curdle or separate if cooked too long. A few minutes to heat it up a bit if needed will definitely be ok though)! Do you add milk or water to the soup ? I’m making this recipe tonight for the second time. I made it as written the first time and it was delicious. The gruyere is a little pricey but gives it a great flavor. I would encourage anyone that is questioning this recipe to make it as written and enjoy. While I wouldn’t describe myself as a foodie, I’m a mac and cheese snob and this recipe is going to thw top of the list. Thank you. Question my husband is a vegetarian. What other soup would you suggest. Thanks! Cream of Celery works well in this recipe. I can of cream of chicken… a big can or small one? You will need a 10.5 oz can of soup. The recipe looks great! If I wanted to make this ahead of time and then heat it up later, what would you recommend? Make a Caserole, after Crock pot cooking or baking —add the last few minutes –cooked broccoli florets & cooked 1lb. ground beef or 2c cubed HAM. My baking dish is 2 1/2 qts. Should I make any adjustments to measurements? As long as the recipe fits in your casserole dish, it will be fine to bake. You’ll just want to ensure it is hot in the middle. Planning on making this for a potluck. When you stated that you were able to double the recipe, is it as listed or is the recipe listed a ‘single’ batch? Debating how much to make…Thanks! It is listed as a single batch. I made this a couple of weeks ago and added broccoli and bacon for the last 30 minutes of cooking. Made it more of a meal than a side dish. Will be serving it again this week to friends, I’m already prepared when they ask for the recipe. Thanks so much for such an easy, tasty recipe! Delicious additions, thank you for sharing! I’m so glad everyone loved it Becky! Thank you for the tip on the swiss, I’ll have to give it a try! What size of cream of chicken? I read in the previous comments that’s its best to shred a block of cheese instead of using shredded cheese in the bag. However, just curious…has anybody made it with the pre-shredded cheese and if so, did it turn out ok? Is there a substitution for the mayo? My young daughter loves mac and cheese but has an egg allergy. I have only made this recipe as written so I can’t say for sure. I have seen egg free Mayo spreads although I haven’t tried them. We are vegetarian so you made this with cream of mushroom soup instead and it was amazing!!! Thank you for the awesome recipe! I’m glad that you found a substitute to make it enjoyable, Becca! Thanks for sharing! I’m making this for a potluck tomorrow. Will the noodles be okay cooked al dente ahead of time and stored in the refrigerator overnight? Thanks! I should also add that I’ll be mixing it together tonight as well! Yes, that will be fine (even if the noodles are in it. I would suggest cooling the sauce slightly before mixing the noodles in so they don’t overcook. My boyfriend doesn’t cook for himself, preferring to eat sugar, carb, and processed junk. Even though many may feel this dish has too much salt, and fat, except for the canned soup it is home made, and real food. And next time I could plan ahead to make cream of chicken soup. Anyway he loves this recipe, next time I will add some frozen peas and carrots at the end, since he doesn’t like vegetables much but will eat them when mixed. I love your ideas for additions! Is using velveeta cheese okay? The block? I have not tried Velveeta in this recipe. What size can of cream of chicken do I use? Can this recipe be cut in half? Would like to make for just two. Yes you could cut it in half. The cooking time would likely be less so you might have to keep an eye on it. I would say about 60-90 minutes. I would like to make this to take to a holiday feast at my kids daycare tomorrow – can it be reheated in the crock pot on warm? Yes it can. It can also be prepared the night before and cooked while you’re at daycare the next morning if that works better for you. I have to cook for 40 people do you think I can quadruple the recipe in a 7 quart slow Cooker? Doubling this recipe almost fills my 6QT so you might need two slow cookers to quadruple the recipe. Has anyone had any luck freezing this? I like to double recipes and freeze half. Just not sure what the mayo/sour cream/soup would do. If I did freeze it would it be after cooking? Then just thaw and reheat? I froze my leftovers, they were delicious when reheated! Hi! I want to make this recipe for thanksgiving! Do you think it would be alright to double the recipe? I just tested doubling this today! :) I doubled the recipe in a 6QT slow cooker and cooked on high for 2 1/2 hours, stirring after 1 hour and 2 hours. Worked perfectly! Hi Holly! It looks absolutely Delish. I doubled and it’s about half way threw. I sampled for taste and the cream of chicken seems to be overpowering right now. Normal? Should I modify whatsoever? I don’t find the cream of chicken overpowering in the final product once everything is melted together and cooked through. Did you double the recipe? This recipe calls for one can of condensed soup and if you’ve added two that might be why the flavor is overpowering to you. Hi! This recipe looks fantastic but is there a substitute for the cream of chicken soup? I am gluten free so cannot eat that. Thanks! I have only tried this recipe as written. Hopefully another reader may have a gluten free suggestion! You could make your own cream of chicken soup using cornstarch, or another thickener such as tapioca starch. What size crockpot do you suggest using? I have successfully made this recipe in both a 4QT and 6QT slow cooker. Hi! I am making this on thanksgiving ..I have 10 adults. Should I double the recipe? Has anyone ever doubled it? Thanks and happy holidays! Hi Holly. I’m extremely interested in making this. I’m wanting to take it to work for a potluck. I work in surgery so I’m not able to monitor my crock pot very well. Do you think it would be ok to make ahead of time in the crockpot and then refrigerate? And put it on warm to heat it back up? You can certainly make this recipe and refrigerate it and then cook it for the 2 hours at work. I made this last night and my husband and I were very overwhelmed by the amount of cheese and felt it was overpowering (I used 4 cups of shredded cheddar). It was creamy but I think next time I will decrease the amount of cheese. Hi, I’ve got a couple of questions..
first,.I like to make food for bigger crowds, say 25 to even 50 people…do you think this recipe could be multiplied and cooked in a roaster instead of a crock pot, or would the roaster cook it too fast/hot? second, this recipe kind of reminds me of a “cheesy potatoes” recipe I have, do you think you could turn it into cheesy potatoes by using frozen hash browns instead of macaroni? Yes, I think it would work well as cheesy hashbrowns. I haven’t tried cooking it in a roaster but since this recipe cooks well in both the slow cooker and the oven, I think it would work. I want to make this, but with a different type of pasta. Is 2 cups of dry macaroni the same as a 16 ounce box? I hope this isn’t a stupid question, but what size of Cream of chicken is used? The small regular cans or the larger cans? Great question, the cream of chicken is 10.5oz. I tried the crock pot Mac and cheese. I was awesome. Planning now to cook mine this way for Thanksgiving. Could you use cheddar or nacho cheese soup instead of the cream of chicken soup? I made this last evening and it was wonderful! My fiancé loved it. So easy to make and will definitely be one of my “go to” recipes. I am so glad you enjoyed this recipe! It is one of my favorites! Wondering if this recipe would hold up well if I just add all the ingredients to the crock, & refrigerated overnight? I have a work potluck next week, & this would be perfect! I would like to make it the night before & cook on low in the crockpot the next day until lunch. Or should I just cook all ingredients the night before, & have the crock on the “warm” setting at work the next day? Anyone have advice? Yes, you can certainly have it all prepared in the crock the night before. Why wouldn’t you use Campbell’s Condensed Cheddar Cheese instead of Cream of Chicken? Even Cream of Celery would seem to work better. What did I do wrong? Cheese all separated! Yuck. Doesn’t look like yours. Plus brown around sides. Oh no Joanne. The brown bits around the edges are expected (like a baked mac & cheese). Dairy can separate in the slow cooker when it is cooked for too long or on too high of a temperature. How long did you cook it for? It is possible that your slow cooker runs a little bit hotter. I don’t have sour cream or any soups in the house, what can I use in place of them? You could try yogurt or greek yogurt in place of the sour cream. You could use any flavour of “cream of” soup such as chicken, celery or mushroom. If you don’t have soup at all, I’m not sure what you could replace with without changing the recipe as dairy can separate in the slow cooker if cooked too long. Anyway, I have been trying Mac and cheese recipes for years. I have tried them all. I look for the right balance between cost, ease of recipe and of course taste. This recipe I tried because of how different the ingredients were. I was a bit skeptical but went ahead and tried it. OMG is all I have to say. This is hands down one of the best recipes I’ve ever had. The taste is amazing and so easy to make. – I didn’t have Colby but did have some mozzarella which worked fine. I would cook on low next time as high burned the sides (which tasted great!) but it cooked too fast. This is a great recipe, seriously, nice work! :D Yay, I’m so glad you loved this recipe Ryan, it’s one of my favorites!! Wow! This recipe is amaze balls! My family and I loved it! I didn’t have any mustard powder, so I used just a small squirt of sriracha mustard. Also, we didn’t have gruyere cheese. Fortunately, we always have fontina. I love fontina because I like the way melts. Boy, this turned out delicious! I am going to have to try this again, and next time I will make it exactly as the recipe says. I use a 4 qt slow cooker. Csn I use Velveeta cheese? I have only tried this recipe as written. You may have already answered this is another comment, but do you think a can of cheddar cheese soup would work instead of cream of chicken, mushroom or celery? Or would that be TOO cheesy? Thanks! this was really good. I added a cup of diced ham. think the ham made it a little salty but still excellent. I will definately make this again. So glad you enjoyed this Jeff!! 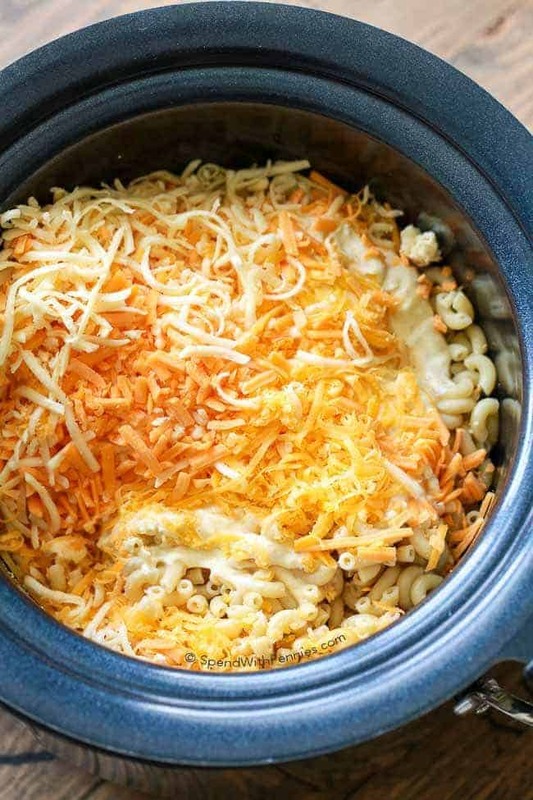 The crock pot mac n cheese sounds divine!! Question: my husband is having a grand opening at one of his businesses and I’m in charge of making the Mac n Cheese – I was just going to make my normal recipe and put it in the crock pot to stay warm, but I want to make yours instead. 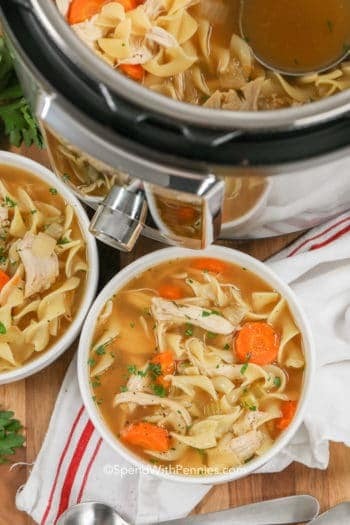 I have 2 large crockpots, so could I double or even triple the recipe for each crock pot or would the noodles take up too much room for it to cook properly? Thanks so much for your help! I love all your posts!!! I would say you could easily double it for each slow cooker. You’ll want to ensure your slow cooker isn’t more than 3/4 full. Because it will be quite full you’ll want to give it a stir part way through cooking. Hi! This looks so good, but I would like to triple the recipe for a crowd. Do you suggest keeping the cooking time the same in the crockpot? Also, do you suggest shredded cheese in the bag or shred a block of cheese? You may like to add a little bit onto the cooking time and give it a stir while cooking just to make sure the center gets heated too. While either would work, I personally shred my own cheese as the pre-shredded does have extra starches added to keep the cheese from sticking. Can u freeze this recipe into individual portions?? Hi Holly! Do you recommend using sharp or mild cheddar? Thanks! Either will work. I personally prefer sharp because I love the stronger cheddar flavor. Thank you for this amazing recipe! I stumbled upon it last month, and it has become a favorite! My kids who are 21 and 22 make it too! Delicious fast and easy for us very busy people. I’m so glad all of you have enjoyed this recipe! My question is about the Ultra Creamy Mac’n Cheese in the Slow Cooker recipe. If you make it in the oven instead of the slow cooker do you cook the macaroni fully or still al dente. Thanks! Tried it tonight & it tasted good. Used cream of mushroom soup instead. Also mixed it some buttered panko bread crumbs. Could I use truffle oil somehow? You could certainly drizzle it on just before serving. Can I double this recipe for the slow cooker? Yes, this recipe can be doubled. You may need to give it a stir part way through. Can I refrigerate this and bake the next day? Is it an okay “make ahead” meal…. Like would it be okay if I prepared it all and warmed it up the next day? I haven’t tried it that way but I do think it would work. You’ll just want to be sure not to overcook your pasta. Do you think substituting gluten free vegetable broth would work in place of the cream of chicken soup? I want to make this crockpot Mac and cheese so bad, but I have someone who has a gluten allergy and another who is a vegetarian. The broth and they cream of chicken are very different in consistency. You would likely need to find something that is a creamier texture to substitute. In that case I would just leave out the mustard. 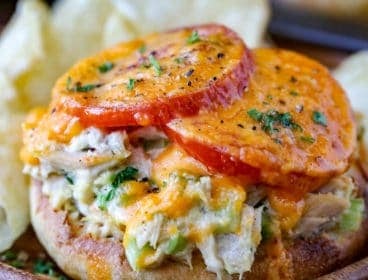 Has anyone tried subbing the mayo out for this recipe? Both of my kids are allergic to egg, so mayo is a no go in our house! 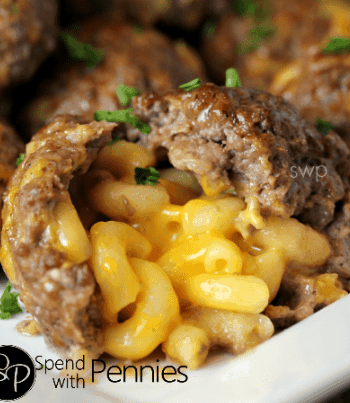 I want to try it because Mac and cheese in the crockpot would be heaven sent for us! I made this tonight and my daughter and I loved it! So easy and so satisfying! I added some cream cheese to it for my own twist but I think it would have been great without it. Thank you so much for taking the time to let me know. I’ve updated the post. I hope you enjoy it! Can you double this recipe? Great idea for football spaghetti dinner but need at least double this amount! You can double it depending on slow cooker size (you would need at least a 6QT slow cooker and will likely need to give it a stir in the middle of cooking). This was cooked in a 4QT slow cooker. If doubling this recipe, I’d suggest a 6QT slow cooker. Enjoy! Could you use shells instead of elbow macaroni? <3 Thank you Kathy! I hope you enjoyed this recipe as much as I do! Did you use condensed cream of chicken….I have that on hand would prefer to use it……..thanks!!! Yes, that’s the right one. Enjoy! Made the recipe just as it is written and everyone loved it…..The smokey Gruyere cheese really makes this dish! Only change I would make is to add more cheese by half more of each kind to make it creamier! Thank you we loved it! I’m so glad everyone loved it Mike! I agree, the Gruyere is so good in this recipe! This is seriously the best Mac n cheese ever!! I may have added a little cream cheese not much and jalapeños, corn and bacon and omg it’s heaven!!! Seriously amazing!! Thank you so much for such a great recipe! I’m so glad you love this recipe as much as I do! Bacon & Jalapeno would be perfect in this!! This is yummy but I have a silly question. If you use all cheddar cheese (no greyere), do you use 4 c cheddar cheese or 7 c? Great question, you will need a total of 4 cups of cheese. Thank you! This is delicious! Have you ever tried putting panko on top when baking in the oven? I’ve been looking for a creamy Mac n cheese for my daughters first birthday and this definitely is perfect! I haven’t but that would be delicious too! I know people have been leery about Mayo. I was Leary about cream of chicken soup in Mac n cheese..I followed the recipe exactly. My crock Pot cooks way too high, even on low, so mine was done in an hour and. Had to add milk as it was all in one clump.. End result, was requested to be made again. Glad your family enjoyed this Dawn! I tried this tonight and it was delicious! I made a few changes. I added 1tsp of garlic powder and a cup of noodles. When it was done, I decided I wanted it to be a little crusty, so I poured it into my cast iron Dutch oven, added bread crumbs and put it under the broiler. I think next time, I’ll just cook it in the cast iron instead of the crock pot. This is a keeper! I’m so glad you enjoyed it Susan! I was in a hurry so I forgot to look for some gruyere (swiss) so I just used cheddar. I also only had shell macaroni on hand. Normally I wouldn’t touch the cream of chicken but I know how delicious mayo and sour cream is in a potato salad so I was intriqued by this receipe, being a mac an cheese lover. It is FABULOUS. I know people love to come to recipe sites and talk about how they don’t like the recipe posted or they tweaked it like this etc. THIS NEEDS AND SHOULD NOT BE TWEAKED, it is PERFECT as it is. This will be on the Thanksgiving table this year, too! Thanks for an easy and indulgent mac and cheese!!! I have no idea what I did wrong. It came out dry and you could taste the mayo. Hmm, I’m not sure why it came out dry. Did you measure the cheese using measuring cups (4 cups)? Did you make the recipe exactly as written? No, you don’t notice the chicken from the soup at all. Hi can I used prepared mustard in place of powder? I haven’t tried substituting prepared mustard in this recipe. I would be more likely to add a dash of dijon mustard. I’m not sure how much macaroni you added or if it was precooked but you could try adding extra of the sauce ingredients if you’ve added extra pasta & broccoli. This recipe uses condensed cream of chicken soup. You can use cream of celery, cream of cheddar cheese or cream of mushroom soup. Mine did not get creamy like this. Its rather chunky. Not sure what happened… I used the Mayo that has olive oil in it, would that make a difference? I haven’t tried it with olive oil mayo but that shouldn’t make it chunky. What temperature (low/high) and for how long did it cook? Did you substitute any other ingredients? I was so anxious to try this that I didn’t read the recipe first, just went to the store to buy cream of cheddar soup – I assumed that was what I needed, lol & Scoobi-Do’s instead of elbows. While looking for the cream of cheddar I spotted cream of bacon!!! I had no idea that there was such a thing. I am not so patiently waiting for it to cook – it tasted amazing uncooked so I can just imagine how awesome it will be all hot and creamy. Thanks!!! I’ve never heard of cream of bacon either!! Hi. 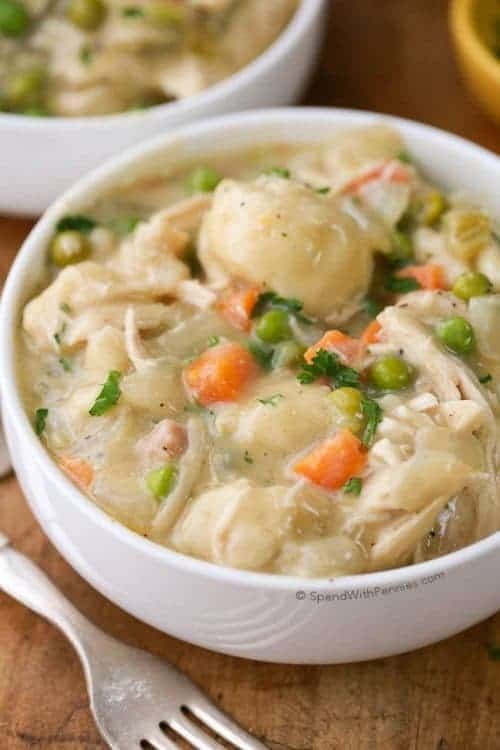 What can use instead of chicken condensed soup? You can use any condensed soup (cream of mushroom, cream of celery etc). quick question, bought Campbell’s condensed cream of chicken soup, do I need to add the water to make the recipe properly? Hi Holly! No need to post my comment or reply, I scrolled up and saw someone else already asked the question & no need to add water. I am multiplying this recipe X5 tomorrow for a Labor Day party with 100+ people. I am baking in a huge roasting pan. Wish me luck, I sooooo hope this turns out as good as others have commented! Thanks again! Mac n cheese is a favorite of ours, will try this. Looks wonderful! What size can of cream of chicken and also the way your recipe is written, it reads that’s I can use 4 cups of cheddar to replace 1 cup Gruyere cheese. Is that right? Or are you saying I can replace Gruyere with 1 cup cheddar?? Thought 7 cups of cheese sounded like a lot but maybe that’s why it looks so good? You will use 4 cups of cheese total. The soup is 10.5oz. Do you have to cook the pasta first? Yes you cook the pasta but you want it very firm. Any would work in this recipe, I often use Hellmans light. What if you can’t precook the noodles? How much liquid do you add? I haven’t tried it without precooking the noodles. Sounds great & so easy to make. I have only made this recipe as written so I can’t say for sure. How man does this serve? LOVE this recipe!! Thanks Holly! I added burger & tomatoes & Yum!!! Hope it’s useful to you as well!! Love your recipes…again!!! I love the additions you make! Thank you so much for sharing your tips for cooking it in the slow cooker! Just put everything in the crock pot. Used mozzarella, feta and cheddar. I also added some minced garlic. I have 3 teenage boys so I have doubled the recipe. Looks amazing. Can’t wait to see how it turns out. 1 cup of shredded cheese would weigh approximately 4 oz. This recipe can definitely be doubled/tripled. The cooking time will need to be slightly adjusted depending on how full the slow cooker is (and you may need to stir it part way through cooking). Has any one tried using gluten free noodles in this recipe? I’m worried they won’t hold up, but really want to give this recipe a try. Thank you! As a vegetarian what soup would you suggest to replace the chicken? I just fed my family your “lazy lasagna” they said it was the best thing they ever had!! I’m hooked! I’m so glad they loved it! You can use cream of celery or cream of mushroom in this recipe, I’ve tried both before with great results! I am not a mac n cheese fan but was asked to bring something for kids at a bbq. Figured mac n cheese fit the request. I am sooooo glad i made your recipe. Could probably have tripled the recipe and still run out. Amount made based on camper crockpot size. I have my family asking why i haven’t made this before. Thanks. So glad everyone loved it Pat! Yes, honey, yes! I tried it and loved it. So much easier than cooking on the stove and stirring a bunch of cheese into condensed milk until melted. I’ll never make mac n cheese any other way. Oh, and I only needed 2 hours on low so definitely check your own slowcooker. I wouldn’t even fool with boiling the pasta first. Are there any variations for all day slow cooking? I put things in before I leave for work in the morning. I think the pasta would over cook with all day cooking, even on low. I tried this last week and it is amazing! The only thing I added was chicken. My family loved it. I will definitely be making this again. Thank you for the recipe! Chicken would be great in this!! Made this tonight! Added bacon, it was amazing. Thank you so much. Do you cook everything in the crock pot on high for 2 hours before you add the noodles or is that with the noodles? That is with the noodles. I haven’t tried it but that would be delicious! Made it with the bacon. Oh so creamy and good! It’s on my weekly list now. I am going to try this tonight!! 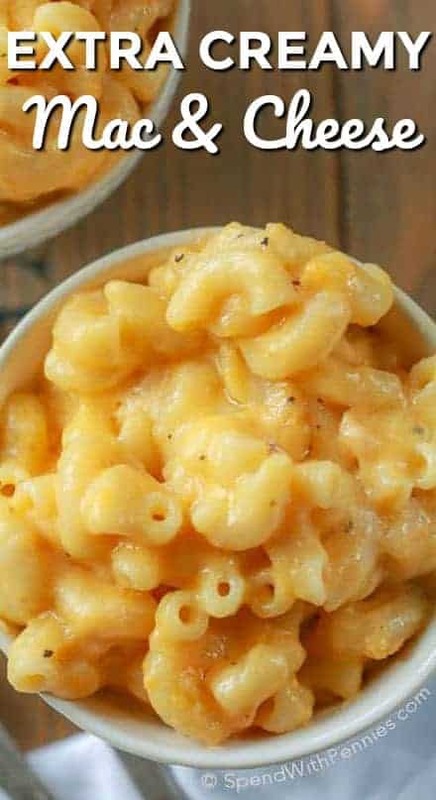 I have never made mac and cheese, other than kraft lol, however this sounds pretty easy, and I have read alot of the comments, and figure why not try it! My whole family loves mac and cheese so this will make them all happy! Ohhh! I hope they love this just as much as we do! I’m a little confused on the timing. At the top of the recipe it says a total of 12 mins but at the bottom of the recipe it says 2-3 hours. Which is it? The hands on prep time is about 12 minutes. It will cook in the slow cooker for 2-3 hours. I just wanted to say that this recipe is a find and a keeper!! I was in search for a delicious, creamy mac and cheese and this one is it! I used 4 cups of sharp cheddar and it had great taste. (Gruyere cheese is a little pricey) may use it for a special holiday . Other than that ….it’s one that I will make put down in my book for favorites! It gets an A+!! Hey, I’m wondering if I could double this recipe in 1 crock pot? I’m making lunch for a function and would want to make sure that there is enough for everyone! What about a roasting pan? You can certainly double (and bake this recipe). If doubling this in the slow cooker you may need to adjust the cooking time slightly but several readers have had success doubling this recipe. HELP, I followed your directions, but it did not turn out creamy at all, had a great taste, but it was a big stuck together ball. I used the assumption that a cup = 8 oz. I will review what I did so you can help, thanks. A) = 2 cups noodles = 1 16 oz. box. B) = 1 can cream of chicken soup, 14 oz., no water. C) = 4 cups of cheese = 4 8 oz. bags of cheese. We had to add 1 1/2 cups of milk during the last half hour to get any type of creamy cheesy look and flavor and we both thought we could have added more milk. So what did I not understand, we would like to try again because we liked the flavor. Thank you for helping me. When measuring 8oz in a measuring cup this a liquid measure whereas 8 oz of pasta or cheese is a weight so it can’t be measured the same way. 2 cups of macaroni noodles would weigh about 8oz so that would mean you doubled the pasta. 1 cup of shredded cheese would weigh approximately 4 oz so this recipe would have required only 2 x 8oz of cheese, not 4 bags. In this recipe it’s best if you use a measuring cup for the measurements. I hope that helps. Oh my gosh, no wonder — thanks for your help.m we were ll try it again with correct measurements. You’re so welcome! I can’t wait to hear back if you try it again! :) Enjoy! Do you cover or leave uncovered? Hello, I would love to try this recipe. Can I use the Campbell’s cheese soup instead of cream of chicken? That would definitely work! I’ve changed the “cream of” just based on what I have on hand. Can you substitute cream of cheddar soup instead of cream of chicken? Can I make this on a stove top? I haven’t tried this one on the stovetop. This recepi seems amazing! If I want to do a larger portion for 40 people. Should I really multiply it by around 6? This recipe is one of my favorites (I am making a video of it this week coming up)!! You can certainly multiply it to make more servings however I haven’t tried cooking this in large portions in the slow cooker. You may like to consider baking it in the oven. If using cheddar cheese, I just wanted to make sure that it is correct that you would use 4 cups vs. the 1 cup of gruyere. Also, do you shred the cheese or just cut into cubes? Thanks!! Can’t wait to make this! You would use 4 cups of cheese total… either 3 cups cheddar + 1 cup gruyere OR 4 cups cheddar. The cheese should be shredded. I only had to cook the noodles for 3 minutes before tossing in slow cookers. Outstanding recipe. Thank you! So glad you enjoyed it Catherine! I made the creamy crock pot macaroni and cheese to take to Mom’s last Thanksgiving. I was in too much of a hurry to taste it, but it smelled heavenly. On the way to the car, one of the handles on my crock pot broke and the whole thing smashed on the ground. I still haven’t made it again yet, but on the bright side, I got a new crock pot for Christmas. I just wanted to thank you for posting such wonderful recipes. Oh my gosh, how heartbreaking! I’m sorry that happened… but yay for new crock pots!! You’re so welcome, I’m glad you enjoy them! Have a great weekend Dianne! I made this last night and it is amazing! I have been craving really good mac’n’cheese and most restaurants don’t quite meet my expectations. My picky 6 year old liked it and my 2 year old loved it. My husband even thought it was quite tasty. I will be making it again very soon as I still have enough Gruyere for another batch! I also used cream of broccoli soup, and while I found it to be tasty, I did not particularly care for the broccoli flavor (nobody else seemed to notice though). I will use cream of celery next time. Also, I cooked it on low and it was done in an hour. Good thing I set a timer to make sure I mixed it! I’m so glad you enjoyed it Stephanie! I love Gruyere so much! Just wondering if you add a can of water with the soup? No you don’t need to add water to the soup, just use it condensed. I made this for a birthday party. It turned out great! I doubled the recipe, but forgot to buy double some of the ingredients so I made due with pantry items. I used 1 can of cheese soup and one can of can of chicken. I also used 6 cups of medium cheddar cheese and 2 cups of American. Everything else was by the recipe. It turned out great and everyone loved it. Thanks for the recipe, I’ll definitely use it again and again! I’m thinking of making this for my child’s birthday party. I’m expecting 30-40 people. Thoughts on if I should double or triple this? We’re going to have pizza and hot dogs too, so it won’t be a “main” dish. Thanks! I do know people have successfully doubled it and I’m sure tripling it would be ok if you gave it a stir in between. To put it in perspective, each recipe makes the equivalent to a standard 9×13 size casserole. I think double would likely be enough however, this recipe does reheat well. I’d love to hear how it works out for you as I’m sure you’re not the only one wondering about 2x or 3x the recipe. Thanks! I’ll try it and let you know :-) Do you think it would turn out fine if I substituted cheese soup instead of the chicken? Do you think it would be ok to combine all ingredients tonight and keep in the fridge, except the noodles? I haven’t tried it but I think it should work out just fine for you. This was DELICIOUS!!!! Since I was short on time, I made it in the oven, and it came out perfectly. My family absolutely loved it! Thanks for the great recipe. I made this tonight and it came out great! I did cook it in the oven because I like the crispy edges. The only differences from the original recipe I did was using smoked gruyere instead of the regular and I added chopped ham to make it more of a meal. Thinking about doubling this and making it for christmas dinner. This is defiantly a special occasion dish due to the extreme richness of it overall. 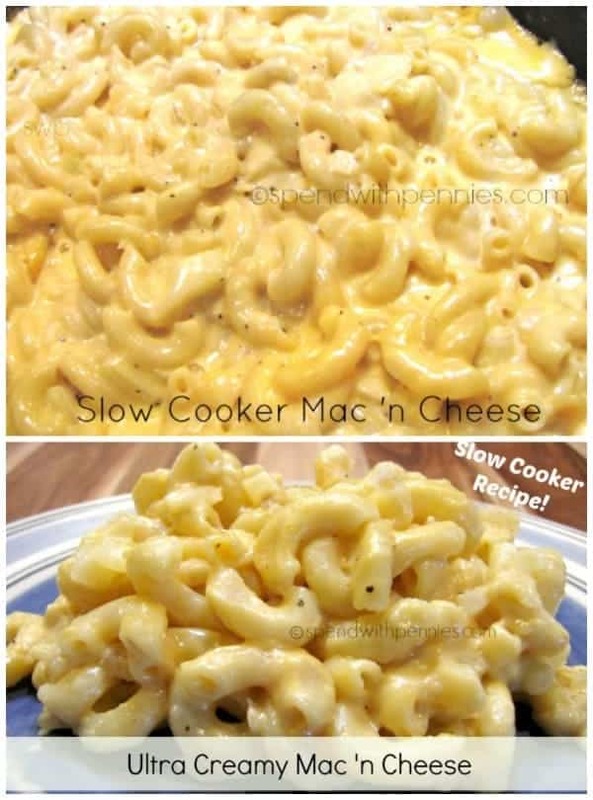 I do like the idea of slow-cooker mac & cheese and have tried a couple of different recipes from the internet, but unfortunately the ones I’ve used before haven’t really delivered. Because of past failures, I must admit I was initially a bit sceptical about some of the ingredients used in this recipe – the can of soup? The mayonnaise? But I followed the instructions (substituting a wodge of cream cheese as suggested as I didn’t have sour cream, and cooking the dish for an hour in the regular oven as I hadn’t allowed enough time to slow cook) – and oh my goodness, it was absolutely delicious. Without doubt the best macaroni cheese I’ve ever tasted – let alone made myself. It turned out savoury and cheesy and creamy with a wonderful texture . The whole family loved it! Your recipe’s a definite keeper – thank you so much for sharing it. I’m so glad you loved it Kat! Does this recipe reheat well? If I make this the night before a party, could I just turn the crock pot on warm the a few hours before the event and add some extra milk? Because this recipe only takes 2-3 hours to cook, you might like to prepare your ingredients the night before and cook it before the event instead of reheating it. This recipe looks super yummy! I made crock pot mac once and at the end it was very grainy.. hoping this one comes out better! I was skeptical about the ingredients but after reading comments/reviews on here I’m sure it’ll be a hit. Question, though: would you suggest using any other cheese besides gruyere (or Swiss)? Like Colby-Jack, perhaps? I think most cheeses would work well in this recipe. I might recommend a sharper cheese just for flavor. I have a similar recipe, but instead of cream soup, you use a can of cheddar cheese condensed soup…extra cheesiness. Hi Holly–I am getting married in 2 weeks, and the theme is backyard BBQ, and I must have mac n cheese! This recipe looks amazing! I am wondering if you’ve ever tried making this recipe ahead and freezing it? Congratulations on your upcoming wedding Jen! I haven’t tried freezing it so I’m not sure how it would work. Hopefully someone else here has tried it and can give you some feedback. Yes, it does get the yummy crusty cheese at the edges. I bake at 350F for 1 hour. I do it covered for 30 min and then remove the foil and bake an additional 30 minutes. Cooking it too long or on too high a temperature can cause the separation. (It is possible that your slow cooker cooks at a higher temperature). Love beans & weenies! :) I think the swiss will work just fine, might be a little bit of a different flavor but still great I’m sure! I have made this several times now, and I love it! Thank you! I don’t use canned soups. Can you substitute a homemade white sauce for the sauce? I haven’t tried it with a homemade sauce but hopefully someone else here can give you some feedback. Can’t wait to try this out! Currently in the crock pot right now. I had 4 cups of velvetta cheese on hand and used that. Is that going to change the outcome? Yes, I do think adding 4 cups of Velveeta cheese will change the flavor & texture of this recipe… but I’m sure it will still be delicious! I made this yesterday afternoon for my family and all I can say is how incredibly delicious it was. I really thought I’d have enough for leftovers today but we couldn’t get enough of it and there’s hardly any left. I have never written a review before an ANYTHING-but this recipe is definitely amazing and I will be making it again and quite soon. Thank you, Holly!!!! I’m so glad you loved this one Angela! :) Thank you for your review! This looks good and the comments make me feel very hopeful but one concern which I’m hoping people who have made this can answer. Does it have a tangy flavor or does the cheese cover up the tang you would get with the mayo and sour cream? 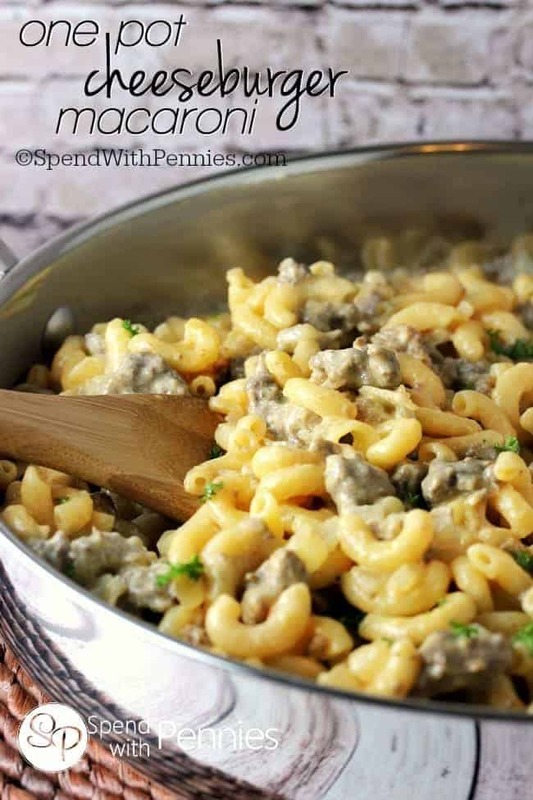 My boyfriend hates the taste of sour cream and mayo but I would love to make this and top it with the Dr pepper pork and crispy onion straws but worried the Mac and cheese will have a tang that the cheese won’t disguise. The only thing I have a beef with in this recipe is how vague it is on how big the can of soup is. Is it 10 3/4 oz can or the 24 oz family size? It’s the 10 3/4 oz can. I originally put in only the small can, but when it was ready to serve, it wasn’t as creamy as I had thought it would be. I ended up putting a second can in the pot. Turned out wonderful. :) So glad you enjoyed this Brianna! This was my first mac and cheese I ever made from scratch. Followed the recipe as written but doubled the recipe as I was taking it to my husbands work xmas party in a crockpot. It was devoured! I too questioned the mayonnaise ingredient but it seemed like a credible binder without the egg. I had seen another comment recommending staying away from pre-shredded cheese as the ingredient that keeps it from sticking together in the bag inhibits the sticking together in a casserole. I don’t know if this is true but I shredded my own cheese. Truly awesome recipe, making it again tonight for my family. So glad you enjoyed it Lisa, this is definitely one of my favorites too! I had another Mac n cheese planned for thanksgiving today, but saw this last night and decided to switch. I’m using 1 cup of sharp white cheddar and 3 cups of smoked Gouda only because that’s what I have on hand. Hope it turns out as good as yours!! 3 cups of cheddar + 1 cup of gruyere OR 4 cups of cheddar. Either way the cheese totals 4 cups. :) Enjoy, this is my absolute favorite! Which do you prefer? With Gruyere or just cheddar? What does the Gruyere do for the taste? Personally I love the flavor the gruyere adds. It’s like a mild swiss and just adds a bit of richness (kind of like a parmesan adds richness when you add it to mozzarella). Holly I do not have access to a stove top or oven. I only have the crock pot and a microwave. Can I make this? Yes, this recipe can be made in the slow cooker. You can cook the pasta in the microwave before adding to the slow cooker. When I use the oven, do I first bake it covered for 30 minutes, then uncovered for 30 minutes, for a total of 60 minutes? Or…bake it either covered or uncovered for a total of 30 minutes? I scrolled through comments and found my answer. 60 minutes total! Thank you. Wanting to make this for Thanksgiving!. Reading the reviews on how good it is makes me so excited :) just curious.. What kind of Chedder cheese is best? The velvetta block or shredded cheese? Thanks so much!! I’ll be sure and post my results :) can’t wait. Wondering if I can freeze this before cooking? I made the full recipe and it’s far too much for two of us. This sounds so good, I think I’m going to make this tomorrow! Could I use the Quinoa gluten free noodles? I haven’t tried it with other types of noodles so I can’t say for sure if it would work. If you do try, please let us know how it works out! I’m so glad you loved it Cori!! Fluid ounces is a measure of liquid volume (fl. oz.) and there are 8 fl.oz. in 1 cup. Making mac and cheese in the oven doesn’t take much more effort than this. AND it doesn’t use processed food like soup in a can. I just don’t understand why anyone would use that as an ingredient in their food. Simple food, made without processed ingredients, tastes so much better and is better for you. Also, crock pots are for lazy people. This recipe really is delicious!! If you don’t want to use the canned soup, I do have a recipe here for Homemade Condensed Soup. I do have to say that I don’t think crock pots are for lazy people, I love my crock pot! It’s wonderful to have a meal ready after a long day to feed hungry kids! Also great for cooking sides (like mashed potatoes when you’re oven is full of turkey dinner) or if you don’t want to turn on the oven on a hot day! It’s also the best way to make a very inexpensive cut of meat taste tender and delicious! I agree. Crock pots are not for lazy people. They are for very busy people that want to feed their families good nutritious meals . Well that was kind of rude. By that standard, I guess we should all build a fire outside and cook over that. What is the difference it you use the oven or a slow cooker? Maybe if you work less than 45/50 hours a week or don’t work at all it might be considered lazy. Anyway, I am making this now, and so far what I have tasted is great. Coral, I agree with you. What June said is totally rude, and also ridiculous. I have a daughter and two daughters-in-law who are all great cooks, and all use crock pots. My daughter is a busy stay-at-home mother of 3 and makes delicious home made meals in her crock pot frequently. One daughter-in-law is a women who works 50 hours a week, and uses a crock pot mostly for family get-togethers. Her cooking would blow you away. The other daughter-in-law is the mom of a baby and works part time. She’s also a great cook on a budget and loves her crock pot for home made meals. June, don’t be a food snob. It’s not becoming. Crockpots are mainly for BUSY people! I love crockpot meals on vacation (like when you’re renting a house somewhere), or when you want to enjoy family time & not spend all day in the kitchen. You do a little prep work, go to work (or have fu. With the fam) and dinner is ready when you get home. I love my crock pot and I am far from a ‘lazy cook’. A good crock pot and a variety of healthy recipes to go in it is part of a great cook’s essential kitchen. This recipe looks fantastic! I’m a mac and cheese nut and am always looking for new, creative and simple ways to make this favourite meal. This one I am definitely trying. Thank you for sharing! Crock pots are for busy people. You owe me and I’m sure others an apology. I worked 72 hours a week after my husband died. If not for crock pots my kids would have had to eat fast food junk. Lazy people? No its for a mom that works 22 hours a day and still needs to feed her family of 6. Really? Or someone, like myself, who has a chronic illness… I use my crock pot so that even on the days I’m feeling lousy, I can prepare a meal early enough in the day that my family gets a home cooked dinner regardless… As far as I’m concerned, that’s far from “lazy”. How about crock pots are for “busy” people. How does “lazy” come into play when the end result is a home cooked meal? Wow! I am a stay-at-home mother of 4, and I cook in my crockpot 3+ times a week. Laziness has nothing to do with it. When we get home from school functions, baseball, dance, playing at the park, going to the library, nature walks, bike riding, and everything else we are doing together as a family, we finish out our day by sitting down together to a hot, healthy, home-cooked meal. If it makes me lazy because I would rather spend time with my family, than spend half the afternoon cooking, I guess yay for being lazy! I made it and it’s good. However, I guess I am old fashioned and don’t understand why ‘you’ just don’t make a white sauce and add cheese to it? A LOT cheaper; the cost of a couple tablespoons butter and flour and milk are less than mayo, sour cream and soup…….. Added a can of diced tomatoes and some chopped weiners to it, then cooked bacon on top……. I’m always turned off of crock pit recipes that require me to do a step before, like boil the noodles. Is there any way to cheat on that part, like add some water and let the noodles get cooked while it heats? I haven’t tried it that way but I really love the idea! I am definitely going to play with it and let you know if I come up with a way to do it! I want to try the raw noodles also. Am thinking I might have to cook a little longer and add the creamed products later. I am in the middle of a kitchen remodel and not even a microwave. My boys want Mac and Cheese and I was wondering if you figured out how to make this without boiling the noodles first? Fantastic mac and cheese! Had friends over and this was a side dish, and can’t get over how many people went for seconds. Easy to make! My husband watched me making it and he wasn’t sure but came back for seconds. This is definitely a keeper! So glad you enjoyed it Shauna! I guess our slow cooker runs hot. I put in for 3 hours on low and after 45 min this was done but we were not ready yet so i put it to simmer. for 2 hours. The sauce broke and lost the creaminess. Just found this and it looks to die for. I love Mac and cheese, started make ng from scratch with Velveeta. Problem I s the taste has changed over the years or maybe be have as it just doesn’t satisfy now! Anxious to try this one! Question: do you use mild or sharp cheddar? And I’ve looked likeked for gruyere in our grocery before but have never found it. Anything comparable in taste for the blend? And just a note. I have a friend who adds a raw egg to her stove top recipe at the end, stirring quickly to blend and not to cook it in chunks. Tastes okay! I prefer to use sharp because I like the stronger flavor, I have made this many many times with just cheddar and it’s wonderful. As far as a substitution for Gruyere, you can try swiss (which I find a little sharper than gruyere). If your grocery has a specialty cheese case in their deli area, it would be there. I found Gruyere cheese at Sam’s Club and Aldi. It’s on the pricey side, I think about $8 a pound or so. We keep kosher — no meat with milk. Instead of cream of chicken soup, would cream of mushroom or broccoli work? Any other suggestions? I haven’t tried freezing it so I can’t say for sure. If you do try it, please let us know how it works out for you. Amazing doesn’t begin to describe this mac n cheese! It tastes like gramma used to make. Thank you for sharing!!!!! So glad you enjoyed Evelyn! Want to try the recipe but think I will put crushed Ritz crackers over the top and bake or broil quickly in hot oven. My family likes the topping as well. You could just brown your Ritz mixture on the stove and serve it on the side. You could even make it ahead of time. Going to make this today! I’m so looking forward to making this! Can I substitute yellow mustard from a bottle for the dry mustard? I don’t have any dry mustard. I would maybe just skip the mustard if you don’t have dry (or add a tiny pinch of cayenne pepper). Personally I’ve used yellow mustard with this recipe and it’s turned out just as nice. You really can use any type of mustard for mac and cheese. I ran out of dry mustard so I tried yellow and it was fine. I’ve experimented with all different types like hot deli and dijon and they all work nicely and add a little something extra. For me, Macaroni and Cheese is a meal and entree, without adding anything extra to it. Anything extra, is usually something served as a side dish with it, but not necessarily in it. 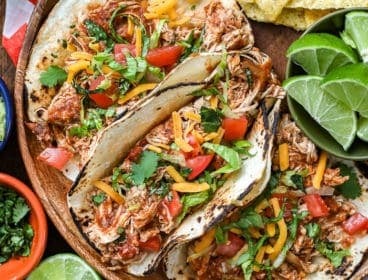 I accidentally came across this site and slow cooker recipe. OMG I have to make this for my boyfriend and me. I’m a diehard mac n cheese nut. I think it’s my birthmark. Lol! I am just wondering if I can do chunks of cheese and shredded cheese or if I should do one or the other? I’m sure either would work as they melt. I would recommend chunk cheese because the shredded cheese has something coated on it to keep the cheese from sticking together … which will affect the texture of the cooked dish. What do I do if I put too much cheese – it plopped out of the bag so I have an extra cup of cheese…. I have loved Mac and cheese since I was old enough to say it (my Mom said I called it little skets,( little spaghetti )) I will def. be trying this! I made this last night for dinner. I added chunked ham and green bell pepper to it and a squirt of sriacha. Like others I was skeptical about the mayonnaise but MAN! was this stuff tasty. My family devoured the WHOLE 9×13 pan of it. Definitely a keeper! The pan size tells me you did this in a conventional oven. Details please? To bake it use a 9×13 pan. Do u still par boil the noodles if your gona use the oven? My slow cooker is 6 Qt. Question: is there any way to get around using mayonnaise? I’m not a fan of it and tend to steer away from it because of its nutritional value (or lack there of). If you’d let me know, that’d be awesome! I haven’t tried substituting it before… I would recommend using either sour cream or greek yogurt as a substitution. If you do choose to use dairy in place of the mayo, be sure to cook on low in the slow cooker and/or add it in towards the end of cooking. Mayonnaise is mostly comprised of oil and eggs. Eggs are used in other dishes as a ‘binder’. 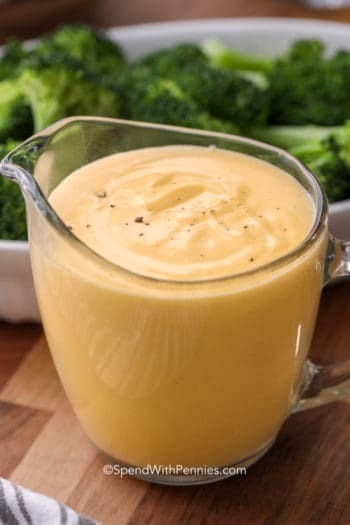 So using mayo in a recipe like this is to hold the cheese sauce together and keep it from becoming too watery or having too much oil from the cheeses separate. Can i please get recipe. You can scroll up and find the recipe above. Real mayo or miracle whip? 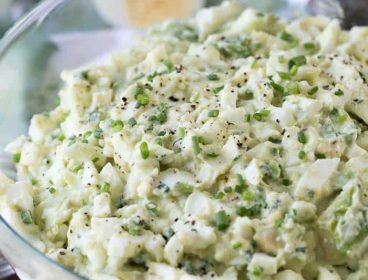 I do not like store bought mayonnaise, however I make my own mayonnaise, and I am a health nut foodie, so this recipe is definitely delicious and also really loaded with good saturated fats (which our body really needs). The best recipe that I have tried for home made mayo is Bacon Fat Mayo. You should definitely use local pastured pig bacon fat, and local farm fresh eggs for your may. This Bacon Mayo is both nutritious and delicious and it adds an entire new dimension to this recipe. I use our Blend-Tec Blender to make this, but any blender, food processor or a bowl and whisk will do. Place the whole egg, mustard, lemon juice and seasoning in the mixer. Mix well, I use the blender at about 4 the whole time. Slowly add the bacon fat – small amounts at a time. Once the the mix is thick and creamy you can add the rest of the fat more quickly. Note: the egg is eaten raw, that’s why you want to get a local quality farm fresh egg. I’m about to give this a try! Any idea how many servings is in the original so I know how to adjust for the party size? Thanks. Does a regular size crockpot allow for a double recipe? Or even triple? It would depend on the size of your slow cooker. My 6.5 qt slow cooker can double this recipe. If I double, how long do I cook for? Thank you for the Mayo Recipe, it sounds delicious. I have a small container in my freezer where i keep bacon grease. It’s wonderful to brown onions in before adding ground beef for sloppy joes! How long can I store the bacon fat mayo? It sounds delicious! I do a lot of cooking and people are always asking me for my recipes. I have stopped giving out my recipes because I constantly get calls to see if they can change an ingredient. Here is my answer. No! If you don’t like an ingredient in a recipe then find another recipe. I am turned off with any recipe that uses mayo. Is there a substitution? Can it be eliminated? I can’t see anyone who likes Macaroni and Cheese to begin with, being turned off by mayonnaise. I wouldn’t normal put it in Macaroni and Cheese, but would be willing to try it. I certainly liked mayonnaise on different sandwiches, and in egg, chicken, and tuna salad. I too was turned off by the thought of using mayo. The total spent on ingredients was about $10. What’s to lose if you don’t like it? This is honestly the BEST mac & cheese recipe, hands down!!!!! So rich in flavor! No, do not eliminate it. Try as the recipe calls for it. You won’t regret it! It is so good with the mayonnaise or salad dressing also. Really great. So glad you like the recipe. That sounds like a great idea to try mayonnaise! my best baked macaroni and cheese recipe is by the Hellman Mayonaise company. Positively delicious. I am expected to bring it to all. Covered dish dinners. I like mayo on only certain things. I understand you not being sure of putting it in a recipe. But when I was a child my mother baked cakes for kids parties and some weddings. And to ever batch of cake mix she made she added one tablespoon of real mayo ( not salad dressing ). You will never eat a cake as moist a one like this even after a few days. Normally mac and cheese has a Bechamel sauce which is flour and oil. Mayo is oil and egg. And they are emulsified so it is not going to hurt and you are not going to taste it. In cakes you will never know it was in there. I promise you. I haven’t had a mayo cake in so long, you’re right, they’re amazing! Turned off by Mayo??? Heck… I could eat it like yogurt… Same with Sour Cream..
and a dollop is a MUST in Lentil Soup…. I have the soup… need to go pick up some Gruyere, and pasta…. This looks amazing Hollly! I have been unsure of pasta meals in the crock pot, as I have been worried about it getting mushy. I have 3 girls who are mac and cheese fanatics, so I’m going to give your recipe a shot this weekend! Eating this mac n cheese as I type this and it is the best homemade mac n cheese I’ve ever made/tried. Thanks for the great recipe! You’re a genius! Will make it often lol. Made this today….was a little leary at first with mac and cheese with mayo and sour cream but thought hey it looks yummy….OMG this is INCREDIBLE. the flavor….and so easy to make. My whole family is in love. I have been told that i better make this one again. So glad you enjoyed it! One of my personal favorites! Hey. So I tried this tonight for my kids. They LOVE it and so do I. I did however make a couple changes. I didn’t have the cream od chicken soup, so I used cream of mushroom. I also added cooked chicken, corn and peas, to round it out. This is definitely a keeper! Thanks for this recipe. I look forward to trying it with chicken soup instead and no add-ins. So glad you enjoyed it! The chicken and veggies sounds like a perfect way to turn it into a meal! Can’t wait to try it! HI Jacqui, What kind of cheese did you use for your children? When I make homemade mac n cheese it doesn’t go over very well with my children. Plus the cheese separates and doesn’t look appetizing. Do I have to use real mayo or miracle whip? There is only 1/2 cup used. Every time I buy mayo for anything for a specific recipe, the balance goes to compost ! Always have Miracle Whip, so that’s what I use. if you like ranch dressing (on salads, chicken, dipping on vegetables…) get a package of the mix–you use mayo and buttermilk. (if you don’t like buttermilk, and have leftovers, you can use that in pancakes or bisquits instead of milk…) Or it makes a mean poundcake!!! Can you use gluten free macaroni and freeze left overs? I haven’t tried it so I can’t say for sure how GF pasta would work. I would not recommend freezing this recipe.